I am off to Houston on Tuesday and thought I would share alittle bit about judging quilts. You have just finished your latest quilt, are proud of your accomplishment and want to show it off. You first share it with your family, then with your small quilting “bee” and finally take it to show and tell at your next guild meeting. For some quilters, this is enough. For others, it is not. Many quilters and fiber artists want to see how their work stacks up against the competition, whether that is hanging it in a local, non-judged show or entering it in a major juried and judged competition. In addition to gaining recognition for your quilts, you also educate other quilters and the general public about quilting and its standards. For local guild shows, this is often a primary reason for holding a show. Additionally, if your quilt is entered in a judged show, you can set goals for improvement based on feedback from the judges or your own comparison with winning quilts. And, of course, you might just win a prize, either a ribbon, cash, or merchandise. Impartiality in judging is important and one way this is done is through use of a panel of independent judges, usually three. Quilt judges may have been trained and certified by the National Quilting Association, or they can be trained through experience. They all adhere to similar standards of judging, although final results will be varied based on the individual judges. ICAP offers three resources recommended for those in judging programs. You can learn more about The Challenge of Judging by Jeannie Spears, Judging Quilts by Katy Christopherson, and a audio recording of a conversation on “The Judge’s Perspective” between Morna McEver Golletz and judges Jane Hall and Scott Murkin on our resources page. We also offer a package with all three of the resources. See the Resources for Judges page on our website. 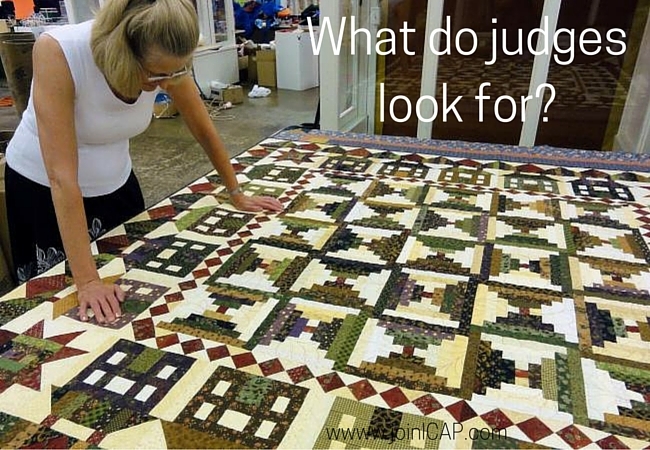 Perhaps you have a different perspective about quilt shows and judging. Your thoughts and experiences are always welcome. You are also welcome to leave a comment on the ICAP Facebook or Google+ pages.